The white rhinoceros is the largest species of rhinoceros and the world’s largest land mammal after the elephant. They have a massive body and large head, short neck and broad chest. Rhinoceros weight typically ranges from 3,000-8,000 lb. On its snout it has two horn-like growths, one behind the other, which are made of solid keratin called agglutinated hair. The front horn is larger and averages 35 inches in length. Adult white rhinos have no natural predators (other than humans) due to their size. All rhinoceros are under threat from habitat loss and poaching for their horn. White rhinoceros are found in the grassland and savannah habitat of southern Africa, primarily on reserves or in national parks. Like all other species of rhinoceros, they have been greatly reduced in numbers. White rhinoceros are herbivore grazers that eat grass, preferring the shortest grains. They drink twice a day if water is available, but if conditions are dry they can live four or five days without water. White rhinoceros are the most social of all rhino species. They live in crashes or herds of up to 14 animals, usually mostly female. Most adult bulls are solitary. They spend about half of the day eating, a third of the day resting, and love wallowing in mud holes to cool down. 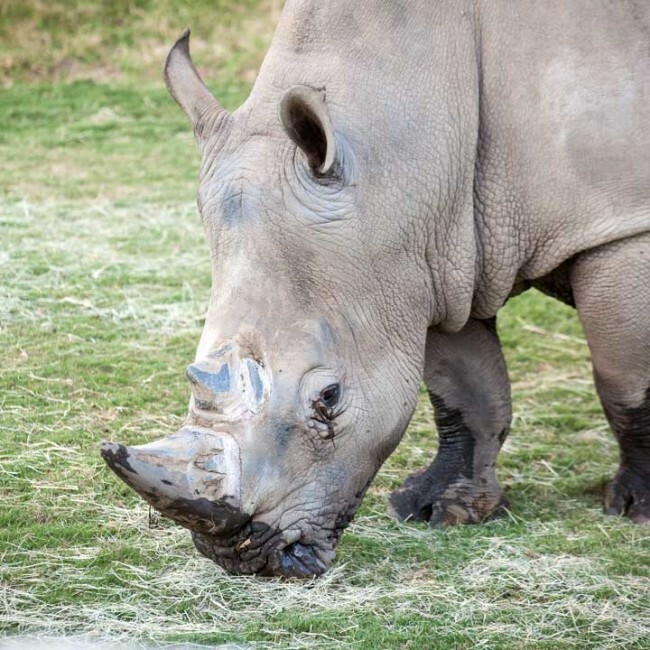 The white rhino is quick and agile and can run up to 30 mph from an almost standing start. White rhinoceros ears can move independently to pick up sounds, but they depend most of all on smell. The olfactory passages which are responsible for smell are larger than their entire brain. The white rhinoceros has the widest set nostrils of any land based animal. A single calf is born after a gestation period of 16-18 months. Calves weigh between 88-140 lb and are unsteady for their first 2-3 days of life. When threatened, the baby will run in front of the mother, who is very protective of her calf and will fight for it vigorously. White rhinos can live to be up to 40-50 years old. Habitat White rhinoceroses are found in grassland and savannah habitat. Diet They will eat fruits and some soft leaves off of bushes. Height 5.6–6.1 feet (At Shoulder, Male). IUCN listed as Near Threatened, largely because of poaching for the horn. There are many people and programs working to protect them. White rhinos are surprisingly agile and can run very fast, up to 30 miles per hour for short periods.